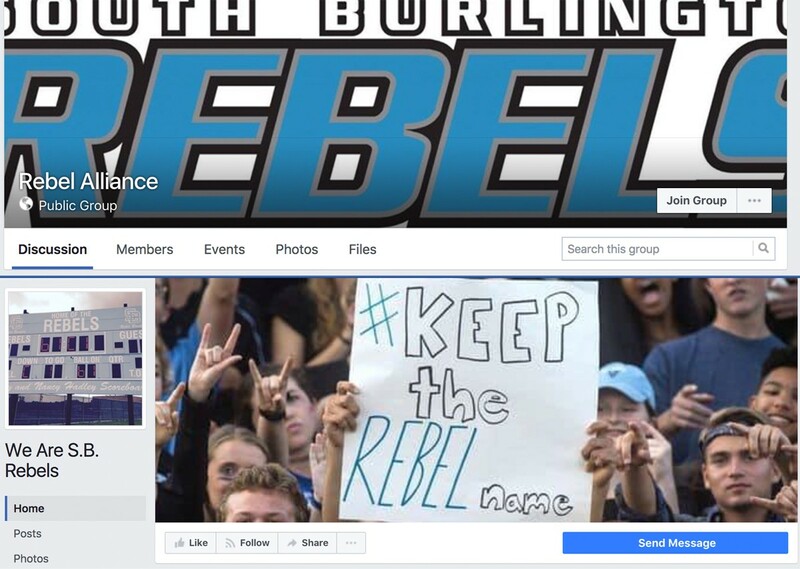 Supporters of the South Burlington "Rebels" moniker are petitioning to keep the name and stirring debate that some say has taken an ugly turn on social media. Last week, the South Burlington School Board voted unanimously to drop the nickname, citing its association with racism and the Confederacy. The February 1 vote came after more than a year of discussion and pleas from some student leaders to shed the offensive moniker. But the conversation is not yet over. At least two pro-Rebel Facebook pages — We Are S.B. Rebels and Rebel Alliance — are fighting the name change. The S.B. Rebels page urges supporters to sign a change.org petition. "We, the students, families and tax payers, do not want the board to change the school nickname," it reads. "We identify as Rebels in the traditional definition of the word. Tax payers should not be forced to pay for something that was not agreed upon by the majority of residents." The page had 649 signatures as of Tuesday evening. "The politically correct have hijacked every aspect of our lives," wrote one supporter. "We need to return to reason. No one is at risk of 'feeling unsafe' because of the Rebel name. Lunacy." Meanwhile, creators of the Rebel Alliance Facebook page are asking volunteers to collect roughly 700 signatures from registered voters for each of two proposed ballot items. One would prohibit the South Burlington City Council and the South Burlington School Board from expending any funds to change the name of Rebels athletic teams. The other would name all South Burlington School District sports teams the Rebels. It's too late for either proposal to get onto the March 7 Town Meeting Day ballot. June might be the soonest the petitions could go out for a public vote, according to one of the organizers, Kiya Batmanglidj, who graduated from South Burlington High School in 1986 and lives in Washington, D.C. He saw the Rebel name as codifying harmless teenage rebellion against authority. "During high school we were all rebels ... I was proud of that." He doesn't see it as racist. "I respectfully disagree with that. At what point do you stop with, what I would call the tyranny of political correctness," said Batmanglidj. His family immigrated to Vermont from Iran in the 1970s during the Iranian hostage crisis. Batmanglidj was a child when he arrived and said he always felt accepted growing up in South Burlington. It's an inclusive community, he said. "I really feel indebted … to South Burlington for having accepted me. I came here during the hostage crisis. I remember on TV, Iranians were getting beaten and spit on in other places," he said. "I was absolutely accepted by all the kids ... Those kids that I went to school with at Orchard (Elementary) are still my best friends." The day after the board voted to drop the name, he organized the Rebel Alliance page and petition drive. "We just think that people of South Burlington should have a say in the matter. That's democracy, that's the way it should be," he opined. Batmanglidj acknowledges that he can't weigh in at the polls on the matter himself since he's registered to vote in D.C., not South Burlington. It's unclear whether the petitions would have any legal weight to undo the actions of the school board if they did win approval at the polls. Either, way, the name change remains a hot-button issue. A blatantly racist comment posted on the change.org petition was removed from the site — but not before it generated a strong response on social media. Much of the discussion has happened on the SB VT Community Watch Facebook page. The chatter reached school board chair Patrick Leduc, who issued a press release Monday calling for civility in the debate. "As individuals, a district, a community, and a state, we must reject and never tolerate any language that is threatening or blatantly racist," it stated. "Our schools are here to educate and unify." In an interview with Seven Days Tuesday, Leduc said the district is not aware of "any specific threat" to students but wanted to denounce some of the language being used online. "That statement is largely being made in response to anonymous statements that were being made on social media that were clearly offensive and racist and hateful," Leduc said. He said he didn't know if ballot items approved by voters would have any binding authority over the board. "I don't know what weight they would carry from an accountability perspective or a legal perspective," Leduc said. Leduc said that he continues to feel the board made the right decision in dropping the name. Molly Walsh is a Seven Days staff writer. James Buck is a multimedia journalist for Seven Days.